That was Robbie Burns’s prayer and when we hear or read it, we nod solemn assent. The truth – about ourselves – will set us free. But only, of course, if that truth is palatable. One of the most irritating habits of radio interviewers here is when somebody visits and they’re asked “How are you liking it here?” The required answer is “Oh we’re having a wonderful time. And the people – they’re so friendly!” And we mount massive advertising campaigns, telling the world to come and visit us, you’re more than welcome. What we really mean in that last case is “Come and visit us, and remember to spend plenty of money when you’re here. We need it”. 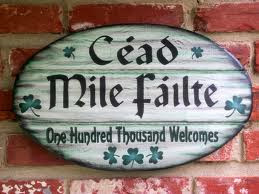 As for being the heart of hospitality, try walking into a rural Irish pub as a stranger. Most of the time it’ll be like the pre-shoot-out bit in an old Western – sudden dip in the conversation, eyes taking you in sideways, then conversation resumes pretending not to have been checking you out. As for racist – well, we do racism really well. In the US, the Irish were among the most active in those opposed to Afro-Americans. At home, we pretend not to notice the colour of people’s skin when it’s really the first thing we take in. The two cases in the south recently highlight it nicely, when the gardaí removed two Roma children, at different location, from their parents, on the assumption that their fairer complexion and hair colour must mean they’d been abducted. Then when DNA tests proved otherwise, they’re handed back to the distraught parents. Like, consider yourself lucky you got away with it this time. Meanwhile the Justice Minister Alan Shatter is doing all he can to dump the blame on the police, nothing to do with me. The last thing we want is to see ourselves as others see us. We’d rather kid them, and ourselves, that our arms are open wide and our hearts filled with respect for those who look different from us. Providing, of course, they’re the President of the United States. Jude, I couldn’t agree more. Can you imagine for one moment the police arriving at my white middle class doorstep to’ take into care’ my 8 year old son who has darker skin than me and brown eyes? And yes, you are correct, Alan Shatter is dumping the blame on the police. Benefiting from dual Israeli/Irish citizenship however, he is unlikely to be minded to draw lessons from the criminal racist state that he pays his real allegiance to, namely Israhell! It almost makes you laugh. Only in Ireland could a ‘Justice’ portfolio be handed over ‘lock, stock and barrel’ to an Israeli! Kinda makes ya wanna packup and head off to the furthest hills of Donegal! Criticism of a politician for their policies is fair enough, but your nasty racist comment does you no credit. I’m surprised Jude let it pass. I accept your criticism in part, gio. My interpretation was that he was indicating that Shatter, through dual citizenship, was a supporter of Israeli policy in the Middle East. If that was incorrect, I’ll check the delete button; but if it’s correct, I think it’s fair comment. Presumably truth revisionist will clarify what he/she meant. Gio, My comment was neither ‘nasty’ or ‘racist.’ .,’ Nasty’, is when you bulldoze a family home that has been there for generations, while the kids look on and cry, to steal their land to house a middle class jew from New York, and call it a settlement. ‘Racist’ is when you ethnically cleanse an entire nation, to steal their land, and set up a criminal state where Israeli nationality, effectively exempts you from any international legal protocols. A nation where it is forbidden for a jew to marry a non jew. Where Ethiopian jews spend their lives in mass detention centres and arab jews can’t vote. People like yourself unknowingly perpetuate the hypocrisy of modern zionism, which, with its total control of all western media, does not allow for any criticism of Israel or its gangster neocons in AIPAC that murder millions in proxy wars against brown skinned people in this perpetual ‘landgrab’ And Gio the reason for this, is that you fail to forensically examine the evidence and accept ‘the truth’ as it is spoonfed to you from that ‘box of lies’ in your living room. Oh, and just for the record, Alan Shatter, despite the subterfuge, is a committed zionist. Why did you say Israeli then? Criticising him for supporting Israeli actions is perfectly fine, but you seem to be grouping all Israelis together. ‘No blacks no Irish no Israelis’ eh? What does “People like myself” mean.Pointing out your racism does not mean I support Israeli policy. Stop making lazy generalizations. Well Jude, truth revisionist has clarified his/her thinking .Any further thoughts on whether you agree with his view of the world? Gio I do group all Israelis together. If you try and analyse the history of the jewish state you will find that 95% of the current inhabitants are a mixture of Ashkenazi jews from the Russian caucauses or immigrants who trace their genetic ancestry back to this source. The other 5% are African, Turkic Mongol and Arabic Shepardic jews who are as dispossessed racially as are the Palestinians. I would refer you to Shlomo Sands’ ‘The invention of the Jewish People’ or Ilan Pappes’ ‘The Ethnic cleansing of Palestine’, both Israeli jewish academics, who have fallen foul of the mainstream media because they tell the truth. Now Gio it therefore follows that if you are the inhabitant of a corrupt state that has stolen land and you partake of this land and dwell therin, then you are by association an accomplice to this crime. I wonder how you would feel if the state confiscated your house and gave it to someone who had just arrived in Ireland a month ago. I would also point out that ‘race’ has a scientifically defined genetic fingerprint. A ‘jew’ is not a ‘race’- it is a religion. Just as Israelis are not a ‘race’ – they are a tapestry of different ethno-centric cultures, that just happen to have taken the land of Palestine from its indigenous inhabitants. So I’m hardly a ‘racist’. I don’t think I make ‘lazy generalisations’. I suspect I perhaps just know a little more of the truth than yourself, because I’m not lazy. Sleepwalk on now! The lazy generalization you made was in referring to ‘people like yourself”.You know nothing of my opinions on Israeli/Palestinian issues as I have not given them, yet you raced on with your assumptions, because I pointed out what are clearly derogatory comments based on a persons ethnic origin. truthrevisionist…you could have just as well been talking about the Irish who left these shores and treated the Native Americans in exactly the same way, most likely worse. Jude only mentioned the Afro American treatment, quite deliberately I suspect. But he does accept that he suffers from bouts of forgetfulness so that may be the reason. Jude;do you not have a view on the above racist comment? Surely the fact that Shatter is Jewish has no bearing on his abilities or lack of them as Justice Minister.As a lawyer,he might be thought to have some knowledge of the legal system. captives in the Gaza Strip. been towards Israel in its treatment of the Palestinians.